Why is the Bongbong Marcos - Du30 Governance Good for the Country? Why is the Bongbong Marcos – Du30 Governance Good for the Country? The opposition stalwarts panic because President Rodrigo Du30 succeeds with his administration. He even increases his popularity after 18 months in office. Bongbong Marcos talks highly of the President as he slams the anti-administration drivers. The energy of Du30’s governance creates a synergy among the people as felt via social media. They get frustrated over the power play displayed by their political enemies. It is obvious that the yellow fighters are more concerned about power play than what is good for the country. 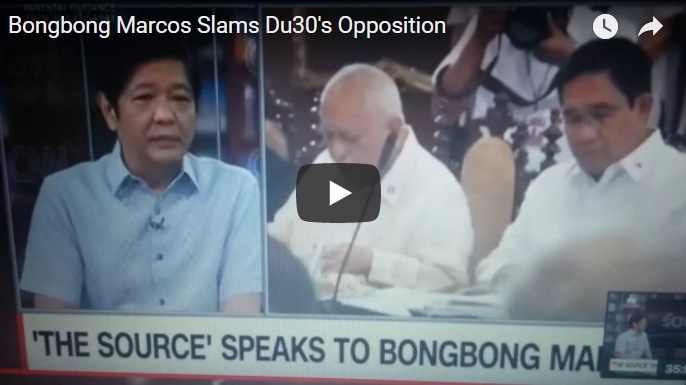 [VIDEO]: Bongbong Marcos said that the President and the people are frustrated over the opposition’s power play. The President is so far successful to launch more reforms and programs. This is to change the tone of government in the country. He shakes up the bureaucracy. Even fires more governments officials that includes many of his appointees. He is definitely serious to check corruption to be effective. He appoints a powerhouse team of economists to design and lead his economic program. Du30’s moves bring economic productivity and modernization to the country. The IS rebels in Mindanao are under control. He is bound to defeat the 48-year-old communist insurgency following the late Ferdinand Marcos’ strategy like the Martial Law. He prioritizes business cooperation and harmony in his foreign policy by befriending China. The late Blas F. Ople, senator, labor secretary during the Marcos regime noted the work of Alexander Hamilton. He said that “energy of will” is crucial in the presidency. This relates to the “energy in the executive” that means “political will.” It also signifies the main agenda of the Bongbong Marcos and President Du30 alliance which is to govern the country to its progress for the welfare of the Filipino people. Intentional or incidental, Duterte goes the path where FM had gone. One instance was the independence of foreign policies which before was just a closely tied to America. The firmness to govern the country with sincerity without the stain of unfairness and corruption. Thus, positive responses show most Filipinos agreed and liked the way they run the government. It is to the credit of social media and the paralyzation of the giant media stations which is being operated by the yellow oligarchs.